Nothing ruins dank weed quite like moldy weed that is “dank” in the wrong way. For growers and users alike, having a supply of moldy weed is tantamount to lighting a fistful of cash on fire. Mold on weed is not only unpleasant to smoke at best and dangerous at worst, but it also can ruin an entire batch of otherwise perfectly good herb. Below are some tips for avoiding moldy weed mishaps and for keeping both flower and bud perfectly dried without ruining the buzz. For those who know their cannabis strains – the appearance, the smell, the taste – detecting moldy weed is easy. When smoked, something about the taste of the bud will be off, and if the bud is infected, then the mold might even be visible and/or give off a foul odor. 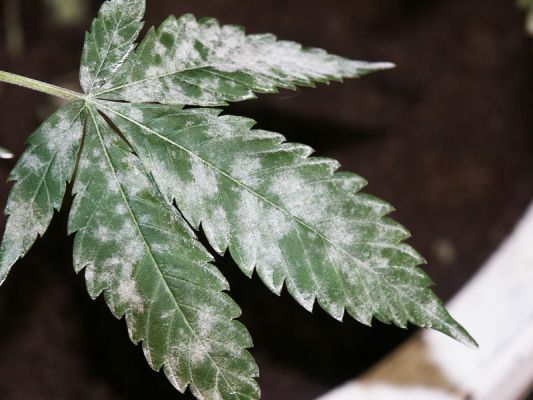 White powdery mold spreads easily, and airborne spores can quickly infect multiple plants, so if any signs of mold are discovered, the infected plant(s) should be removed from the grow tent or room. When mold infects plants early in the grow process, the spread of the infection can be contained and treated with a fungicide, and the crop can be saved. But for plants that have a heavy amount of mold infestation, the whole plant must be thrown out. Bud smokers can visibly detect mold on their weed using a 420 scope, a jeweler’s loop, or anything that magnifies the bud for higher visibility. There are also stash jars with magnifying lids that make it easier to get an up-close look at the herb, whether to check for signs of mold or to admire the bud in general. Mold on weed will stand out from the sticky hairs and the THC-laden trichomes that look like tiny crystals. 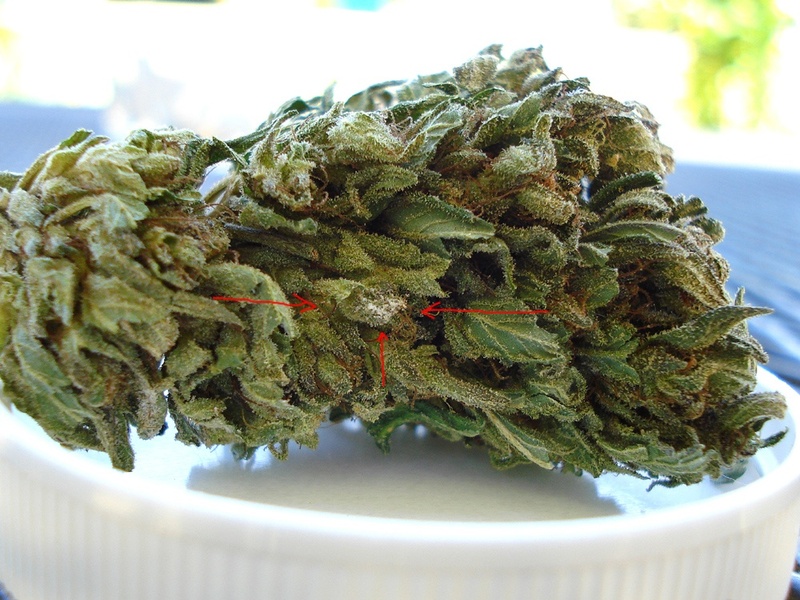 The appearance of mold on dried bud can vary, from sticky webbing to white/gray/yellow fuzz, or black or brown spots or spores. Moldy weed will smell of mildew, or it may give off a rancid odor, almost like urine. Another way to detect moldy weed, although this method is definitely not recommended, is by the flavor. Mold has a distinct, off-putting taste that is easily discernible to the experienced user. Although it is not recommended, there are times when one can accidentally smoke some moldy weed. Depending on the extent of the mold infection, the side effects of smoking moldy weed can range widely. If you think you may have smoked moldy weed, it is best to contact a health care provider. Although according to the DEA, there are no reported deaths due to marijuana overdose, if there is mold on the bud, smoking moldy weed can have some serious adverse effects. Mold spores are actually in the air all around us, and when they find an area heavily laden with moisture and a lack of air circulation, they take root and grow. Mold can spawn and spread in grow rooms with stagnant and humid air. It can also manifest on dry bud when the bud sits in a stash jar that has moisture in it, and that is left capped for enough time for the mold to grow. There are many steps that growers must take throughout the entire grow process to prevent moldy weed. First and foremost, a grow room must have proper air circulation and controlled humidity levels. Mold grows best in wet, humid environments with stagnant air, so it is important to make sure that humidity levels are maintained, both in humid and dry climates, and fans or ventilation systems should be in place to keep the air fresh while using full spectrum grow lights. For more information on maintaining humidity levels in a grow room, check out this video. 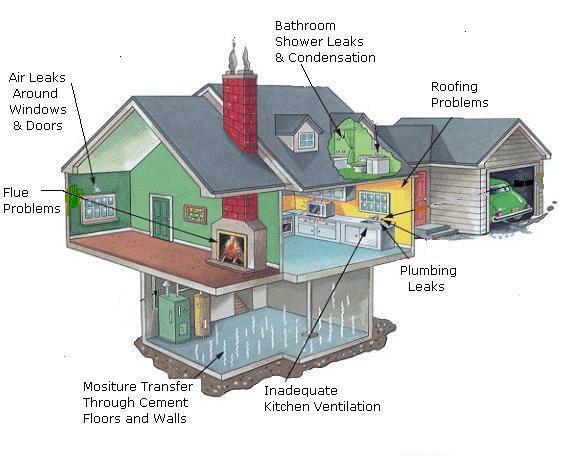 The drying and curing process is also crucial for preventing mold. Once the flower has been harvested and the plant is ready to be dried and cured, the timing and the method of drying can affect the plant’s vulnerability to mold exposure. If the drying process is too lengthy, then mold can develop. On the other hand, if the plant is dried too much, then the bud will be harsh to smoke. When drying weed, humidity levels in the room should be around 50% with room temperatures of around 70°F. For the curing process, when curing in jars, the humidity levels should be around 60-65% with room temperatures around 70°F. Throughout the curing process, it is also important to open the curing containers regularly to allow air circulation. Bud smokers can protect their herb from mold through proper storage. Using plastic bags to store weed is not recommended because they trap moisture. There are plenty of different types of stash gear, like glass jars, mini tins and boxes, or beautifully carved wooden boxes, for storing weed in optimal environments. Hygrometers not only function as elegant stash boxes, but they also control humidity levels within the container. Unfortunately, there is not much that can be done with moldy weed aside from throwing it out. Growers who detect moldy weed at an early enough stage can treat and eliminate mold with fungicides. For users, moldy weed can be smoked with certain methods – such as with bongs, or cooking the weed at 200°F for ten minutes, or super critical extraction – but none of these fully eliminate mold. On a positive note, in states where marijuana is legal for medical or recreational use, dispensaries put their products through rigorous testing and inspection processes, so the risk of moldy weed is low.